Recently I've been having a problem with my seat not staying in position. I've been changing my seat height to nearly the highest position (the lowest position is uncomfortable) but after a minute or two of riding the seat slides right back down to the lowest position. Any ideas on how to make it stay? 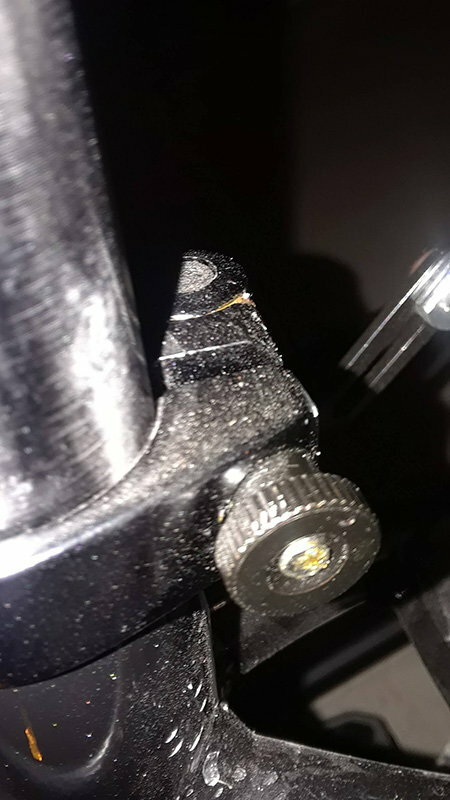 My bike has a quick-release mechanism on the seat post that clamps it in tight or loosens up to change the positioning. #1 Replace the QR with a bolt on one steel bolt steel nut..
On my folding bike I have a need to have the QR, so I added a 2nd one directly gripping the post, itself , so now I have 2. I am 210# .... OP rider weight is a factor ? I'm ~320 pounds, so maybe that's the culprit. Should the QR be replaced with a traditional bolt-style? tighten it more you may have a hard time opening the QR lever ..
Not uncommon to get out the adjustable wrench to get them open, after that... for extra leverage ..
a + will be someone else will have a real challenge trying to steal your seatpost and saddle..
Should? , It Can .. be replaced , But .. you have to measure the frame, tube outside diameter to know which one fits..
Perhaps the Dealer you bought the bike from can help? If You don't need the post lowered.. mid ride ... a bolt type can be bade pretty tight..
Last edited by fietsbob; 02-05-19 at 08:45 PM. Is there an adjuster that you can give a quarter of a turn, to snug it up tighter? I had one quite similar, it had an adjuster on the opposite end of the cam lock. One of my bikes did that. I put a screw type hose clamp on there and it held the seat post height adjustment going on 10+ years. Yes, it should. I have a couple of these in my parts box and they look like a super short hub quick release skewer with a tension adjusting nut opposite the "flag" end. You can tighten the nut to make the flag harder to close and increase the clamping pressure. I think I found an adjustment knob (pic below) that I believe is for the quick release (hiding on the other side), although it seemed fairly tight and wouldn't budge in either direction by hand. Should I take a wrench and tighten it slightly more? The action of the cam squeezes the seat collar around the seat post to hold the seat post securely in place. The amount of clamping force is controlled by the tension adjusting nut. Turning the tension adjusting nut clockwise while keeping the cam lever from rotating increases clamping force; turning it counterclockwise while keeping the cam lever from rotating reduces clamping force. Less than half a turn of the tension adjusting nut can make the difference between safe and unsafe clamping force. If all else fails, I'll take fietsbob's advice and contact the dealer I purchased the bike from. It's a relatively new bike... I purchased it this fall and it has only been on a few rides. That new of a purchase, definitely take it back for assistance if it doesn't want to cooperate. To adjust the tension you first open the cam lever by pulling it away from the clamp. That releases all tension on the seat colllar. Then turn the adjusting nut a fraction of a turn tighter and try to close the lever. It should take a fair bit of hand pressure to close. Repeat this procedure until the lever is hard enough to close. The general rule is that the lever should leave an imprint on your palm when it closes firmly enough. Please note the lever is NOT a wing nut, it is tensioned by the adjusting nut and clamps by pivoting it closed, not by rotating it. That was extremely helpful. I finally was able to tighten the tension nut much tighter than it was after opening the clamp. Thanks. Next time I ride I'll see if it maintains its position. If not, I'll try tightening it slightly more. 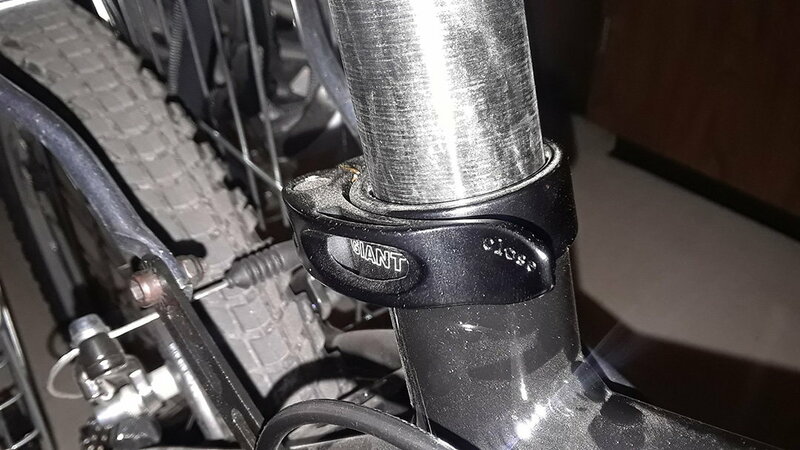 I have used an industrial 2 piece shaft collar on the seat post to prevent if falling into the frame, and the seat post clamp just has to prevent the saddle from coming out of the frame. It sounds to me like you’ve found the solution. For aluminum frames and posts, I have found knurling to be an effective cure. In the absence of a knurling tool, you could mark the post at the desired height, remove it from the frame and make several divots around the circumference with a center punch in the area where the clamp presses on it. Is there any space at all between the knob and the body of that QR lever? Looks pretty close from the photo. If the knob is touching (and since you can't make it turn it might be) I'd remove it and stick a washer under it so that you can tighten it just a little bit more. I doubt it will require very much. The OP simply did not know how to adjust the QR collar. Now he does. He does not need an industrial two-piece shaft collar. He does not need to take a center punch to his seat post to create divots. He does not need whatever products are pictured in fietsbob's haiku. Like an axle quick release, you should adjust the tension such that the lever makes a mark on your palm when you push it home. And lubricating the cam mechanism will give better clamping with less lever force. Yep. Found it - shouldn't budge, and if it does, I know how to tighten the tension. Thanks everyone for your help. I've found and fixed the problem. Well, you're right of course but I think you ought to cut the people who are trying to help a little bit of slack. OP asked his question clear up at post #1 . Potential helpers read his question and attempt to craft an answer it without necessarily reading all of the intermediate posts. That's all it is. Fair enough. Your right. I was unnecessarily snarky. actually the suggestions were Great for my personal situation. i have a tandem that has seat post slipping issues; really like the collar and knurling ideas. those collars also can solve many problems in addition to bicycles. when it comes to problems, many times it is better to have a bunch of solutions, rather than just one that may not work at all. Sora R3000 crank compantible with 5800/6800 chainrings?